Published: Sept. 26, 2012 at 05:07 p.m. Updated: Sept. 26, 2012 at 06:47 p.m. 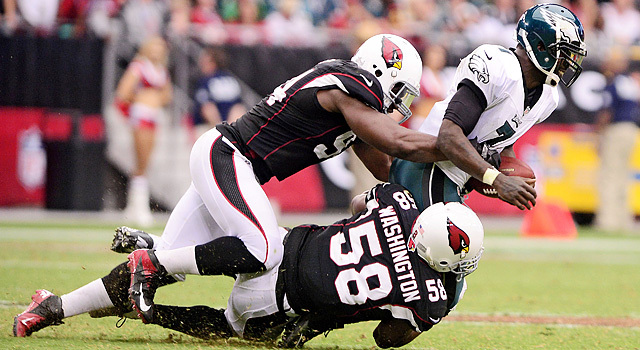 The Arizona Cardinals rank second in the NFL with 12 sacks, including five of Philadelphia Eagles QB Michael Vick. 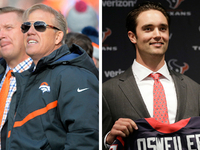 Does the NFL's top defense reside in the desert? Jeremiah: Birds of a feather? That's certainly the buzz in league circles after the Arizona Cardinals suffocated the high-powered offenses of the New England Patriots and Philadelphia Eagles in consecutive weeks, improving the team record to a surprising 3-0. 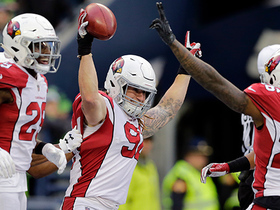 Although growing parity across the NFL leads to upsets on a weekly basis, the way the Cardinals dismantled both teams suggests that their defense deserves a spot at the top of the heap. 1) Ray Horton's organized chaos confounds opponents. When Horton was appointed the Cardinals' defensive coordinator following a successful seven-year stint as the Pittsburgh Steelers' secondary coach, most expected Arizona would run a hybrid 3-4 with unique blitz pressure concepts. Horton certainly hasn't disappointed, installing a high-pressure scheme that routinely features five- and six-man blitzes from a variety of fronts. The pressures are complemented by a bunch of pre-snap movement that is designed to create confusion for blockers at the point of attack. When coordinated with tight coverage in the back end, the heavy blitzing overwhelms ground attacks and forces quarterbacks to throw under duress. 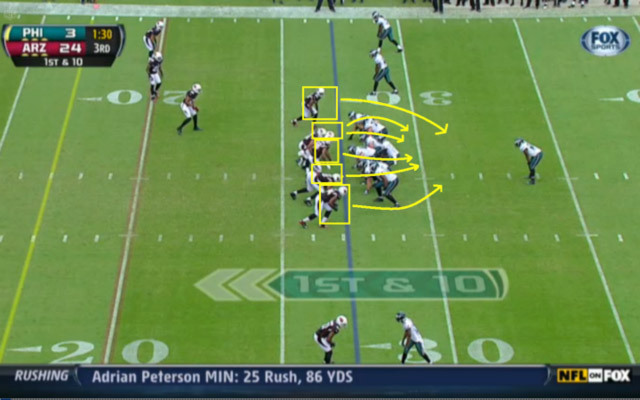 Click here to see full video of the play, which resulted in a Lenon sack of Russell Wilson. 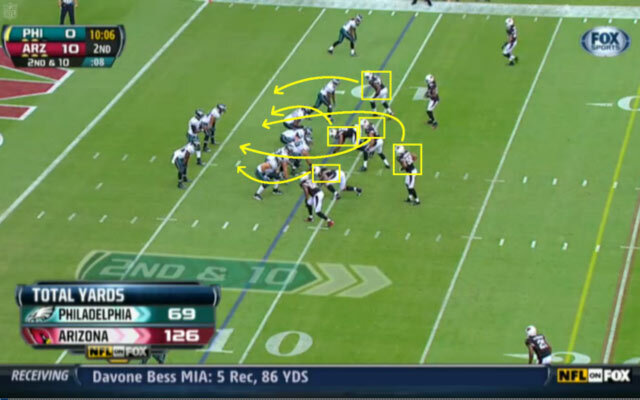 Click here to see full video of the play, which resulted in a sack of Michael Vick by Daryl Washington and Sam Acho. Click here to see full video of the play, which resulted in another Washington sack. 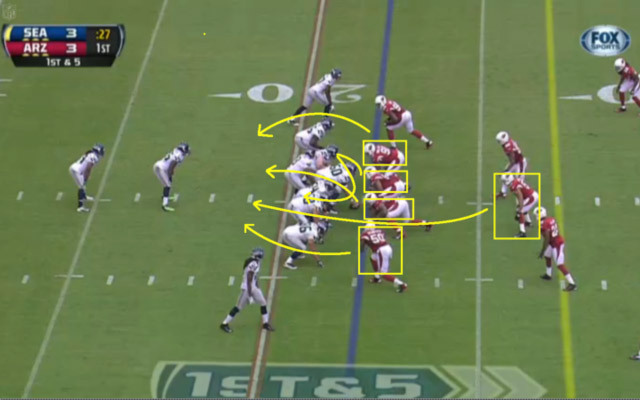 2) The Cardinals are strong down the middle. The best defenses in the NFL are strongest down the middle of the field. In theory, this means that the best personnel on elite units are positioned at defensive tackle, linebacker and safety. Although this isn't exactly the case with the Cardinals, their blue-chip defensive players do play on the interior. Darnell Dockett and Calais Campbell are listed as defensive ends, but the hybrid nature of the Cardinals' 3-4 scheme positions them at the 3-technique (outside shade of the offensive guard) and 5-technique (outside shade of the strong-side offensive tackle) on most downs. Dockett is one of the league's top interior defenders, possessing a combination of size, strength and power that overwhelms blockers at the point of attack. Campbell is emerging as an imposing force who wreaks havoc in the middle with his extraordinary length (6-foot-8) and athleticism. These two take turns dominating between the tackles, creating opportunities for Arizona's linebackers to roam freely through open gaps. Meanwhile, Washington and Lenon torment opponents from their inside linebacker spots on the second level. 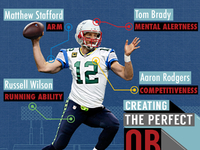 Both can play downhill against the run, while also showing exceptional skills as pass rushers. Safeties Adrian Wilson and Kerry Rhodes are punishing hitters with uncanny ball skills. Although both are at their best when positioned near the line of scrimmage, the duo's collective versatility allows Horton to vary coverages and blitzes according to matchups. With so much talent down the middle of the field, the Cardinals can force opponents to run to the edges, allowing their speedy and quick young defenders to win in pursuit. On passing downs, the presence of a handful of elite defenders between the hashes clogs the middle and forces quarterbacks to make lower-percentage throws to the perimeter. By making quarterbacks direct most of their passes outside of the numbers, the Cardinals decrease the effectiveness of the opponent's passing game and create more opportunities to attack with pressure. 3) The Patrick Peterson factor. The myth of the "shutdown corner" has everyone ready to anoint any guy with decent cover skills as a blue-chip defender, but Peterson is on the cusp of joining the ranks of the truly elite. 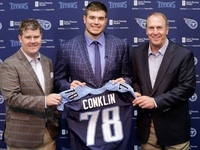 He is a talented athlete with a unique combination of size, strength and quickness that allows him to blanket the NFL's top receivers on the edge. While his game remains a work in progress, Peterson has made significant strides as a cover man in his second season. He is more patient at the line of scrimmage when playing bump-and-run, and he has learned how to take the proper angles to cut receivers off down the field when they escape the initial jams. This allows him to remain in proper position and rely on his natural instincts to make plays on the ball. Peterson can snuff out the opponent's top receiver with little safety help, letting the Cardinals aggressively pressure opponents without surrendering big plays. 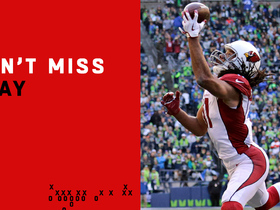 4) The Cardinals make foes kick the ball at the end of drives. The turnover statistic is routinely a point of emphasis for defensive coordinators, but Horton has the Cardinals excelling in two critical areas: third-down conversion rate and red-zone efficiency. 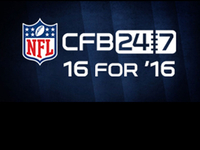 Arizona is holding opponents to a 33 percent conversion rate on third downs, which ranks eighth in the NFL. This means the Cardinals are getting off the field in critical situations and forcing opponents to punt at the end of drives. Part of the Cardinals' success on third down can be attributed to the diversity of their pass rush. The unit ranks second in the NFL in sacks (12), with seven different players contributing to that total. As a result, opponents are unable to direct their pass protection to a designated player or side. Forcing quarterbacks to get rid of the ball quickly with their constant harassment, the Cardinals are winning critical downs on the strength of their pass rush. 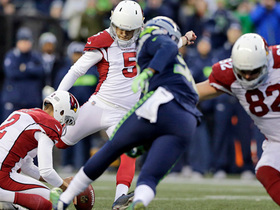 In the red zone, Arizona's defense holds opponents to field goals instead of touchdowns. The unit has allowed just two touchdowns in three games, forcing opponents to settle for nine field goals. As a result, the Cardinals rank second in the NFL in scoring defense (13.3 points per game) while holding 10 of their past 12 opponents to 20 points or fewer. After breaking down the Cardinals' scheme, I was impressed with their ability to attack opponents with Cover-0 pressures inside the 10. 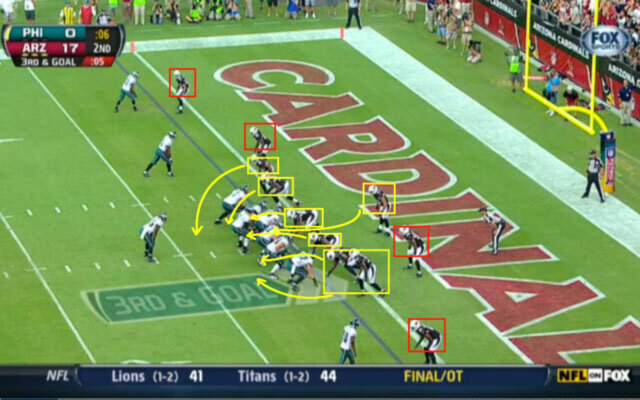 The Cardinals routinely brought all-out blitzes against the Seahawks and Eagles when they penetrated the red zone, and the combination of pressure and coverage led to negative plays for the offense. Wilson's fourth-and-goal pass to Braylon Edwards fell incomplete on this play, clinching the Cardinals' first victory of 2012. Kerry Rhodes came free for a sack, forcing Vick to fumble and resulting in a 93-yard scoop-and-score for James Sanders. Arizona went into halftime with a 24-0 lead.